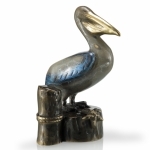 Bird - Pelican Gifts - Click on an item for more details! This Metal Art Pelican on Stand is made with the finest details and materials. Handcrafted for the highest quality and unique design. A treasure to enjoy in your home or garden to last a lifetime. 9 inches W. x 21 inches H.
This exquisite Wooden Pelican on Post will bring a unique and artistic addition to your home or office. Notice the hand painted colors and details. This beautiful piece of art will sure to be enjoyed for a lifetime for all your family and friends. Hand painted wood 24"